Francois Letexier is looking at his watch and immediately ends this match. Substitution. Lucas Alario makes his way off the pitch and Adrian Stanilewicz (Bayer Leverkusen) comes on as his replacement. What a beauty from just outside the box! Lucas Alario (Bayer Leverkusen) lashed the ball with incredible pace and power into the bottom left corner. Andoni Iraola has decided to make a change. Konstantinos Konstantinou (AEK Larnaca) replaces Apostolos Giannou. Jakub Bednarczyk (Bayer Leverkusen) is awarded a yellow card. The referee showed him no mercy. It's time for a substitution. That's the last involvement from Wendell as he is replaced by Jakub Bednarczyk (Bayer Leverkusen). The resulting corner from Hector Hevel (AEK Larnaca) only finds one of the defenders, who heads it out of danger. Goal! After receiving a sweet pass, Paulinho (Bayer Leverkusen) unleashes a shot straight inside the right post. Good team effort! Igor Silva de Almeida (AEK Larnaca) picks up a caution. Mitchell Weiser (Bayer Leverkusen) makes an overly-aggressive challenge and Francois Letexier blows his whistle for a foul. Goal! The corner is whipped in and Dominik Kohr (Bayer Leverkusen) is in the right place at the right time, planting his header into the middle of the goal. He makes it 1:3. Leon Bailey (Bayer Leverkusen) goes over to take the corner kick and it looks like he will swing the ball into the penalty box. A cross from a mid-range free kick, taken by Bayer Leverkusen, is intercepted by one of the defenders. Hector Hevel (AEK Larnaca) thinks that he is fouled by his opponent, but the referee deems him to be the one who commits a foul and awards a free kick to the other team. AEK Larnaca try to maintain the tempo of the game by taking a quick free kick. Paulinho (Bayer Leverkusen) commits a rough challenge and Francois Letexier blows his whistle for an infringement. 7:6 – this is the total number of shots produced by both teams. Substitution. Tete will be replaced by Ivan Trickovski (AEK Larnaca). Joan Tomas (AEK Larnaca) picked up a yellow card from referee. Apostolos Giannou (AEK Larnaca) drives in a shot at goal, but the attempt from the edge of the box flashes just over the bar. What a chance that is! Igor Silva de Almeida (AEK Larnaca) squanders a huge opportunity as he latches on to a perfect cross from the wing. He produces a bullet header from around the penalty spot which goes high over the crossbar! Tete (AEK Larnaca) takes the corner but fails to find any of his teammates. The ball is easily cleared out of danger. 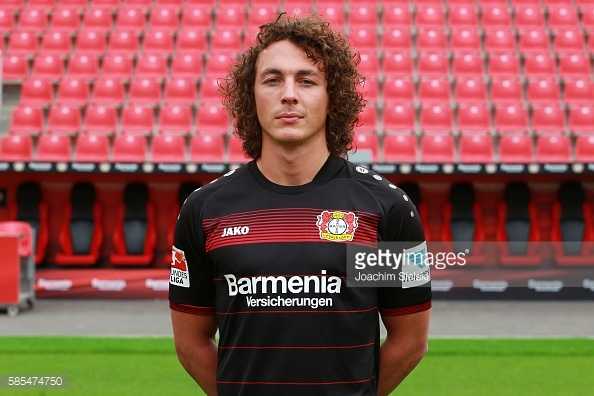 It looks like Dominik Kohr (Bayer Leverkusen) saw red with that tackle. Francois Letexier won't tolerate such behaviour on the pitch and blows for a foul. Referee Francois Letexier blows his whistle to start the second half. Andoni Iraola makes a half-time substitution. Hector Hevel comes on in place of Nacho Cases (AEK Larnaca). The need to improve in the second half has brought about a change. Julian Brandt (Bayer Leverkusen) comes off for Leon Bailey. The linesman raises his flag. Julian Brandt (Bayer Leverkusen) is adjudged offside. Goal! Lucas Alario (Bayer Leverkusen) wins the battle of wills and sends an unstoppable penalty past Andreas Christodoulou into the bottom right corner. Lucas Alario (Bayer Leverkusen) will take the responsibility and he is already preparing the ball. A player from AEK Larnaca brings down an opponent and commits a foul. Bayer Leverkusen have been awarded a penalty kick! Dominik Kohr (Bayer Leverkusen) attempts to release Julian Baumgartlinger with a through ball, but his effort is thwarted by one of the defending players. We can have a look at the statistics now, particularly the total attempts – 2:5. Paulinho (Bayer Leverkusen) commits a foul during an attacking move. Bayer Leverkusen play a few nice passes from player to player, but their possession doesn't last long as an opposition player intercepts a pass. A yellow card for a tackle by Mitchell Weiser (Bayer Leverkusen). Francois Letexier doesn't hesitate at all to make this decision. Goal! Dominik Kohr (Bayer Leverkusen) pounced on a loose ball inside the penalty area and beats the goalkeeper with a shot into the bottom right corner. He makes it 1:1. David Catala (AEK Larnaca) leaps to meet an excellent cross and steers a fantastic header past the goalkeeper, inside the right post. Julian Brandt (Bayer Leverkusen) gives away a foul for a clumsy challenge. Referee Francois Letexier saw the whole situation. The resulting corner from Facundo Garcia (AEK Larnaca) is cleared by the defence. Tete (AEK Larnaca) tries to slide the ball through to a teammate but it's well blocked by a defender. Corner kick. AEK Larnaca will have an opportunity. Isaac Kiese Thelin (Bayer Leverkusen) is flagged for offside. Tete (AEK Larnaca) is caught offside! Isaac Kiese Thelin (Bayer Leverkusen) is adjudged to have been offside when making his run. Apostolos Giannou (AEK Larnaca) is offside and the linesman raises his flag. Bayer Leverkusen fail to score from a corner as Andreas Christodoulou (AEK Larnaca) leaps to collect the ball. Lucas Alario (Bayer Leverkusen) has a sight of goal and shoots towards the right post, but the goalkeeper makes a superb save. Bayer Leverkusen get a corner. The shot by Igor Silva de Almeida (AEK Larnaca) from the edge of the box low towards the middle of the goal lacks power and is easily saved by Thorsten Kirschbaum. Thomas Ioannou (AEK Larnaca) goes on a solo run, but he fails to create a chance as an opposition player blocks him. Francois Letexier was nominated as the referee for this game.